﻿"I wanted to ‘Thank You’ for the service you provided for ordering the mileage books. We received them this morning and are very pleased." Our vehicle mileage log books are designed to help you comply with IRS rules for tracking business vehicle expenses. All of our auto mileage logs include plenty of forms for entering mileage and business vehicle expenses. The resilient plastic coil binding and durable covers make recording vehicle and truck mileage convenient and protect your records against torn pages and water damage. See sample forms in our I.R.S. 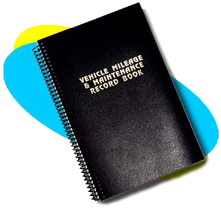 compliant mileage log books and view a video of the original Vehicle Mileage & Maintenance Record Book. See why over 53,000 vehicles, trucks, and fleets have had their mileage tracked by our auto mileage log books. There is no other vehicle mileage log that combines elegant appearance, durability and all of the forms needed to accurately track business vehicle mileage for such an attractive price. You can see for yourself how attractive the Vehicle Mileage & Maintenance Record Book is in the product pictures and the demo video. It's not just about efficient and simple mileage forms. Professionals prefer having an elegant looking mileage log book in their cars and trucks. Why settle for junky looking paper covers when you can have a foil-stamped auto mileage book in your vehicle? Attractive and easy to use! Our mileage log books are perfect for use with fleets of vehicles. Quantity discounts and drop-shipping (call for assistance) make it easy for fleet managers to keep track of mileage for all of their vehicles. Whether you need the deluxe model with maintenance forms, additional summary reports and envelopes for temporary storage of receipts, or the standard log book with just mileage tracking forms and summary sheets, we can help you promote your business with a unique and attractive business gift. These are the auto mileage log books preferred by professionals who demand the best! Custom foil stamping and other options can give your company year-round name recognition. Give your customers a vehicle mileage log book and be remembered! Call our toll-free customer service line for assistance.